Filipino Style Recipe: Siopao is a Chinese steamed buns that is become popular for many Filipinos. Asado and bola-bola are the most popular variety of siopao. 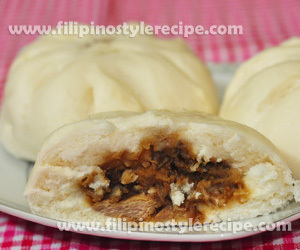 Siopao asado is made up of pork meat cook in soy sauce, oyster sauce, hoisin sauce and cornstarch until thickens. Scoop enough asado in the middle of dough then seal on top. 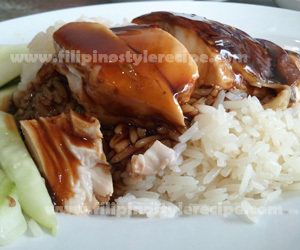 Steam for 20 minutes then serve with siopao sauce. 1. In a pan, heat oil then saute garlic. Add meat then cook until light brown. 2. Add soy sauce, oyster sauce, water and sugar then simmer for an hour or until becomes really tender. Add more water if necessary. 3. Add hoisin sauce and dissolved cornstarch then stir cook until thickens. Remove from heat then set aside. 1. In a large bowl, dissolved yeast and sugar into warm water then set aside for 20 minutes. 2. In a separate bowl, combine flour, baking powder, shortening, salt and yeast mixture then mix until well blended. 3. Knead the combined mixture until becomes smooth and elastic. 4. Transfer in a greased bowl then cover and set aside for 2 hours or until it rises. 5. Knead the dough again then divide into serving pieces. 6. Form each piece into a ball then flatten using rolling pin or your palm. 1. Scoop enough filling in the middle of each dough then seal on top. 2. Place wax paper underneath of each dough then steam for 20 minutes. 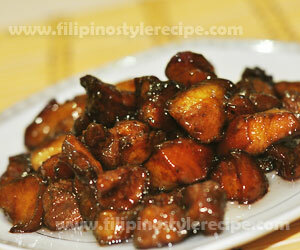 Serve with siopao sauce. 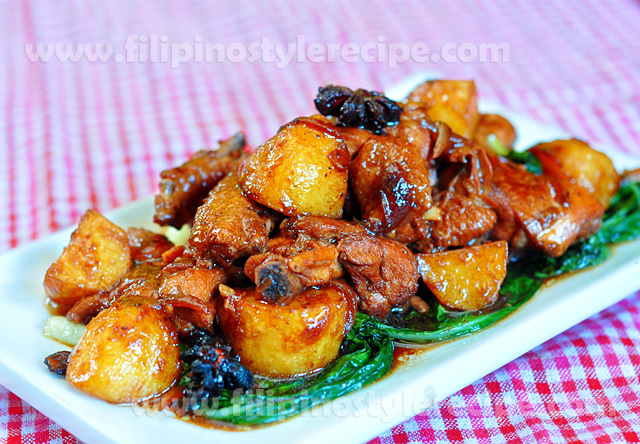 Filipino Style Recipe: Asadong Manok or chicken asado is a sweet chicken dish that was originated from Chinese. Normally chicken marinade of seasonings and boil it until tender. This is similar to pork asado. Estimated time of cooking: 30-40 minutes. 1. In a pot, combine all the marinade ingredients and marinate chicken for 1 hour. 2. Cover and simmer in a low heat until meat is tender. Add water if necessary. Set aside. 1. In a non-stick pan, heat oil and pour a little marinade sauce. 2. Add bok choy and cook for 1 minute. Transfer to serving bowl. 1. In a same pan, pour a little marinade sauce then add honey. 2. Add the chicken and cook again for 2-3 minutes. Transfer to serving bowl with bok choy. 1. In a same pan, pour all the remaining marinade sauce. Stir and simmer until thicken. 2. Pour the sauce over the chicken then serve.